The philosopher and mathematician Pythagoras from Samos Greece: Pythagoras was born on the island of Samos in 570 BC. His mother was native of Samos and his father was a merchant from Tyre. He studied with the priest of Memphis in Egypt, who was famous for his wisdom. After Memphis, he studied at the temples of Tyre and Byblos in Phoenicia. It is most likely in Egypt where he came up with his geometric principles that would lead to his famous theorems. The evidence of his Egyptian inspirations is called the Berlin Papyrus. Pythagoras did not only think up mathematical principles during his life. He also founded a religious society. His society had very strict rules of conduct. The inner circle of the society was called Mathmetikoi. As a member of the society, you had to live at the school, have no personal possessions and had to follow a vegetarian diet. They did allow students from other areas to attend the school. These students, called Akousmatics, were permitted to eat meat and own a few personal things. As a whole, the members of this society were known as Pythagoreans and had a very structured life of religious teaching, common meals, exercise, reading and philosophical study. They had to sing to the Greek god Apollo on a regular basis. They believed that they could use the lyre to cure illnesses of the soul and body. One had to do poetry recitations before and after sleep since they believed this exercise could help improve human memory. The Pythagorean mathematics was summed up by Aristotle. – Pythagoras thought that all things consisted of numbers. All physical bodies are numbers. All the elements of numbers are the elements of everything. – All units possess a magnitude. – Numbers are an expression of the universe. When you are talking about numbers, you are talking about what makes up the universe. – You should regard unity and infinity as substances that form the basis of the universe. There is a limit and there is unlimited. There is an odd and an even. There is one and plurality. There is right and left. There is male and female. Things are at rest and moving. There is straight and crooked. There is square and oblong. Pythagoras believed that this universe was a universe of opposites. He also believed that Monad was God and the good. The good is the true nature of the One. The One is the Mind. The bad side is the indefinite Dyad who is evil and evil has to do with material plurality. Pythagoras possibly believed that the sun was the center of the universe. He always supported that fire was the center of the cosmos. The problem is that it is very difficult to know directly about his teachings. There was a vow of silence required by people who first joined his order. Most information about Pythagoras comes from secondary sources. His original doctrines are unknown and his order scattered all over the known world after 545 BC. In fact, Hicetas, a Pythagorean, was quoted as saying that the earth moved in a circle. Pythagoras is famous for many mathematical principles. One such principle is that the sum of the angles of a triangle is equal to two right angles. His followers were familiar with a generalization that stated a polygon with n sides has a sum of interior angles 2n-4 right angles and a sum of exterior angles equal to four right angles. But his famous theorem stated that when you have a right-angled triangle, the square of the hypotenuse is equal to the sum of the squares of the other two sides. 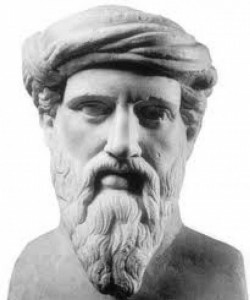 Pythagoras may have discovered irrational numbers. The problem is that it would go against his philosophy that all things are numbers since he meant that a number is a ratio of two whole numbers.